In this solo dining adventure, Gary tries the pho at Saigon Shack, a new Vietnamese place in Greenwich Village. While putting together an opening report post for Eater a few weeks back, I was trying to verify whether Saigon Shack had indeed opened already. I stumbled upon some reviews on their Yelp page which led me to strongly believe that they had opened so that was certainly an easy enough task for the day. Curiosity got the better of me and I started reading through the mostly positive reviews and saw that there was a Tenka coupon for over 50% off of a lunch special – pho, dumplings, and coffee for $6. That’s not too bad, right? 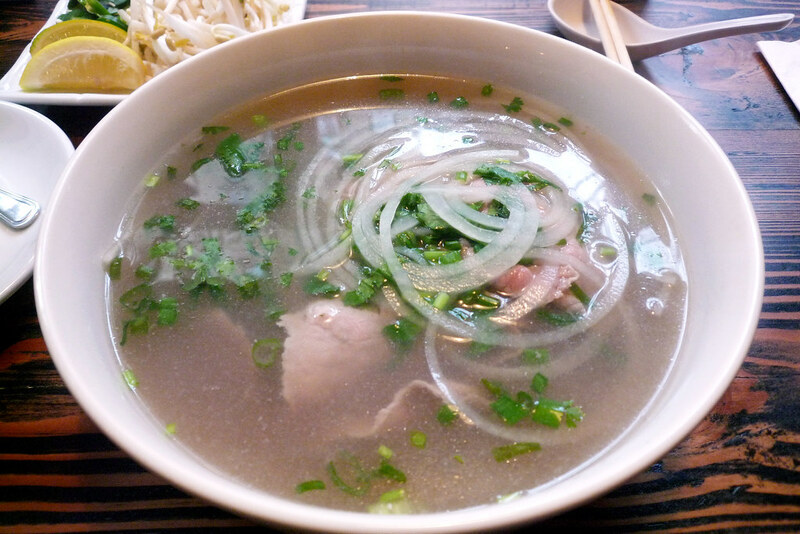 So, armed with the coupon on my trusty Droid, I was off to have a hot bowl of pho on a cold December afternoon. 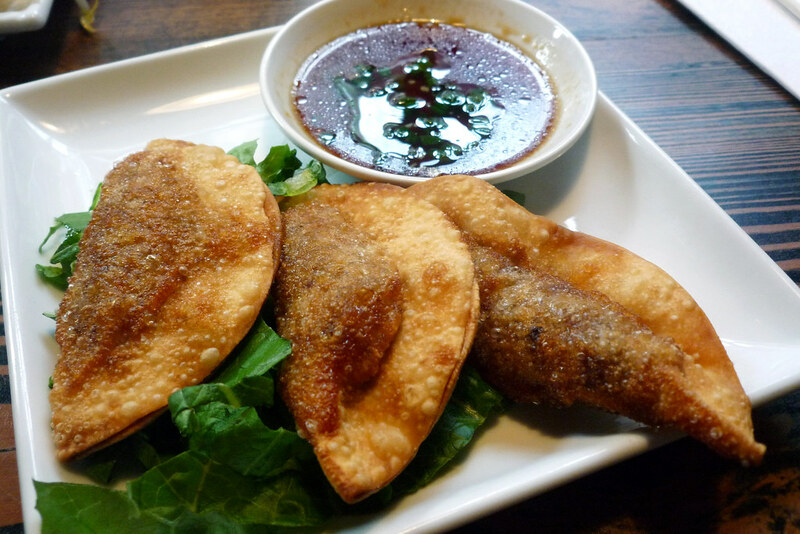 The lunch special comes with Roast Pork Dumpling – three of them. It’s essentially dumpling wrapper around a really tiny amount of filling and then deep fried. It’s golden and brown but not really delicious since all I could taste was dumpling wrapper. The filling to wrapper ratio is just terrible here. I got the Classic Beef Pho to round out the lunch special. the broth looks nice and clean but that’s the problem – it’s clean of any of the depth of flavor you want in a pho broth. It’s thin, decently salted, but just no real flavor. I was dumping fish sauce, hoisin sauce, and sriracha in there just to give it some life. The broth might as well have come from a box or even a can – it’s just that bland and boring. The bright side? I guess there’s a decent amount of beef slices in there and the noodles weren’t overcooked. Also, there’s enough in here to leave you full when you’re done eating through it. That’s something, I guess. Saigon Shack just isn’t for me. For a fraction of their regular prices, I can find much better pho in Chinatown. But let’s be honest here – their business model of Vietnamese food and coffee shop is clearly designed to ensnare nearby NYUers, which I guess is a smart way to go. It’s just a pity they don’t put out better quality food in the process. By the way, I don’t mean to be overly picky but the details of the Tenka coupon deal were as follows: 4 roasted pork dumplings, large pho, and Vietnamese drip coffee. Well, I only got 3 dumplings and I got regular, not Vietnamese drip, coffee. Would that adhering better to the terms of the deal made this a better experience? Sadly, I don’t think it would have helped any. Saigon Shack. 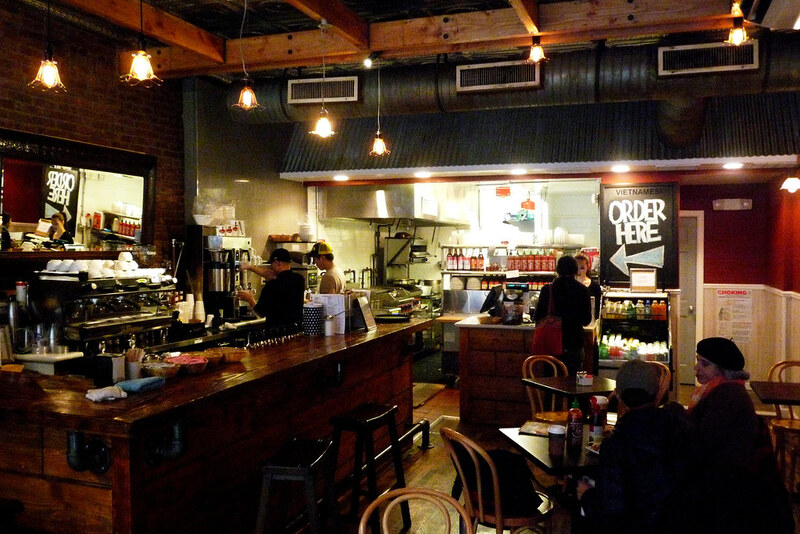 114 MacDougal Street, New York, NY 10012. [Show/Hide Map] (212) 228-0588.